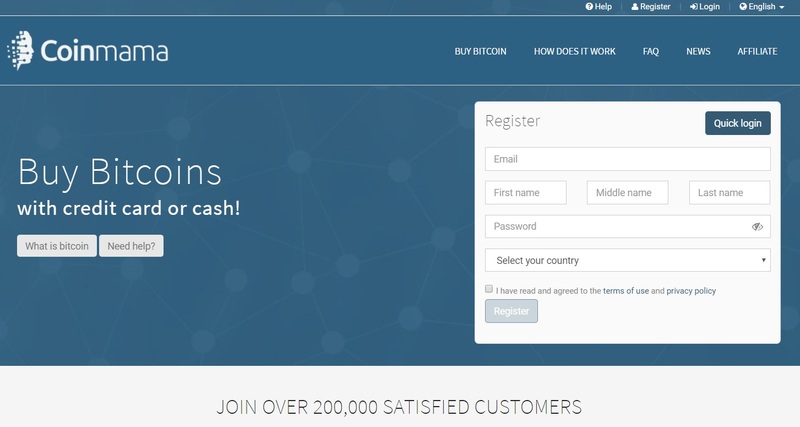 Coinmama Review – Legit Bitcoin Exchange or SCAM? Coinmama is a Bitcoin-selling operation, which supposedly delivers crypto currency to its clients for fiat currency, supporting BTC for EUR and BTC for USD transactions. Various payment methods are supported as well, so Coinmama customers can invest in Bitcoin via credit cards as well as cash. While the business model of the operation is simple and straightforward, and while there are no too-good-to-be-true promises made anywhere, the operation still seems rather shady. Before we delve into the problematic points of the operation and the less-than-reassuring user feedback, let’s see how it’s all supposed to work in an ideal and scam-free world. Users are first required to register and to verify an account. Once they’re done with that, all that’s left to do is to click the “Buy now” button and to choose the method of payment. Visa, MasterCard, Western Union and PM are all accepted. There are a series of instructions provided for payment via credit card as well as cash. Those who want to pay with cash are required to choose Western Union as a payment method. The last step of the operation is to confirm the Bitcoin wallet as well as the transaction, by clicking the confirmation link delivered via email. Who exactly are the people behind Coinmama? This is the first red flag in regards to this operation. They do not have a proper “About Us” section, where a transparent company profile is featured. In fact, they do not have an About Us section at all. They aren’t too keen on sharing any information in this regard. In their Contact section, we learn that the corporate entity behind the site is NBV International s.r.o, a Slovakian company, based at Bozeny Nemcovej 8, Bratislava, 811 04. This is at least a little unexpected, considering that in various user reviews, people talk about UK-, Israel- and even Romania-based operations. While the company itself is indeed registered with the Slovakian financial authorities, the fact that it has been registered on January 27, 2017 isn’t particularly reassuring. The deeper one digs into the corporate intricacies behind the operation, the clearer it becomes why the site is so tight-lipped in this regard. According to the Slovakian financial records, the above said company is under foreign ownership and its Executive Manager is Andri Andreou, who apparently resides in Cyprus. Furthermore, according to the same records, the company is effectively owned by New Bit Ventures Ltd, an Israeli Corporate entity, based at Peam Aviv Street 28a, Givat Chen. Interestingly, if one runs a search on New Bit Ventures, an entirely new company address comes up. The cherry on top of the cake is that Mr. Andri Andreou has an impressive number of other companies registered under his name in Slovakia, including Deguisen s.r.o., Galador s.r.o., Murtlap s.r.o., Mooncalf s.r.o. and Occamy s.r.o. among others. To make a long story short, Coinmama’s corporate background is indeed ridiculously intricate at best and rather shady at worst. The Coinmama website enjoys a domain authority rank of 40/100, and it has only 5 backlinks, from FinanceMagnates, and a couple of much less relevant websites. Coinmama gives promoters the opportunity to earn free bitcoins by bringing new clients into the Coinmama fold. To this end, they offer an impressive selection of referral links and banners. The commission rate is 15%, which isn’t much, but it is enough to set a potentially powerful online marketing machine into motion. This is where things take a sudden downward turn for this operator. There’s no way around this: the community doesn’t like Coinmama, and although there are a few users who take its side in the forum battles raging all over the cryptocurrency industry, for the most part, the feedback is indeed negative. The way the operation is run is rather indicative of a scam, as revealed by some of the Reddit posts from users or would-be users. One such complaint pointed out the fact that the customer was first asked to make a MoneyGram transfer to a certain Laurence Newman, in the UK. The required destination of the funds was then changed to another Laurence Newman, based in Romania. Then, after some more wrangling, yet another Laurence Newman was brought into the equation, this time located in Israel. Other would-be clients have confirmed the original poster’s story. Yet another major problem revealed by user feedback is the apparent lack of support. While Coinmama offers a couple of email addresses for support ([email protected] and [email protected]), they apparently only answer questions when they feel like it, and when buyers have transactions locked in limbo, they apparently don’t really feel like it. A practice some users have found aggravating is the requesting of identity proof by Coinmama over and over. Instead of making their requirements in this regard clear from the get-go, Coinmama reps apparently procrastinate, looking to keep buyer funds hostage for as long as possible. Other clients state that Coinmama only resorted to locking up their monies after a few successful transactions. While Coinmama does indeed look like a legitimate operator, working a simple and straightforward business model that shouldn’t pose any problems to anyone, it makes things unnecessarily complicated for its clients. The unclear corporate background essentially means that buyers don’t really know who they’re dealing with. This, coupled with the naturally decentralized and semi-anonymous nature of digital currencies, doesn’t really inspire trust. The often abysmal user-feedback is the cherry on top of the cake. Coinmama may not be a straightforward swindle, simply stealing money from everyone unfortunate enough to try to make use of their services, but it’s definitely not the opposite of that either. Some of its dealings are shady, and apparently there have indeed been instances when users have seen their money evaporate. In addition to all the above covered complaints, some buyers have pointed out the surprisingly massive discrepancy between the official BTC exchange rate and the one at which their bitcoins were delivered. With so many other options available for Bitcoin buyers, taking a chance with Coinmama doesn’t really make much sense these days. Still, Coinmama is a highly popular Bitcoin exchange, attracting people from all around the world, especially the US, India, the UK, Canada and Australia. Therefore, this Coinmama review will be left inconclusive until our subscribers provide us with some first-hand information about the operation. If you have any experience with Coinmama, please share it with us as a comment below. Thanks for reading our Coinmama Review! Didn’t find information you were looking for? Please let us know. You’re also welcome to contact us if you would like to consult with us about your Bitcoin investment strategy. Read other Bitcoin and Crypto Currency Exchange Reviews. They are definitely a fraud I am waiting for my verification more than 2 months. I tried connecting support many times but no reply. I attempted to buy 3 ETH on 27 November and came up with a Failed response. I tried 6 times and each time unsuccessful. In one instance, however the credit card transaction did go through, even though I did not get the ETH even though it clearly show Failed transaction on my CoinMama logon page. Now, one week later I am still trying to get them to reverse this transaction,They take 2-3 days to respond to emails and then the response is unsatisfactory. Wish I had read these review sooner, and I would not be out of pocket for over 2K. I have used Coinmama once when Coinbase was shut down because of volume or maintenance and blurts coin from them. At that time BTC was rising fast and didn’t want to miss out. I had not problem with them and found the purchase easy and not complicated.